ACME, Mich. -- Jack Nicklaus' golf course at Grand Traverse Resort has had more than two decades to let golfers spread the word of its almost legendary difficulty. But with the myriad of changes in golf equipment and course design, can it still stack up with the fiercest Michigan tracks? At first glance, Jack Nicklaus' Bear Course at Grand Traverse Resort might not seem as fearsome as its reputation. Well, The Bear Course drew a little blood on my scorecard. "There are so many places on The Bear that can eat you alive," said Paul Galligan, director of golf and grounds at Grand Traverse. "It's really hard to shoot your handicap." This is why The Bear's layout has remained largely the same, despite the plethora of newer golf courses with big-name designers to hit the region. Show up expecting the worst - and if you spend enough time around northern Michigan you're sure to have your imagination fired by tales from failed "Bear hunters" - and at first glance the course might not seem as fearsome as its reputation. Fairways aren't terribly difficult to hit, and its 7,000-yard length and 146 slope rating are eclipsed by more recent arrivals. The main difficulty comes in the green complexes. Most are heavily guarded, with bunkering (sand and grass) all around, if not a pond or weeds. Lips are steep and pins are often tucked. Even if you find a wedge in your hand, hitting the green still isn't a gimme. 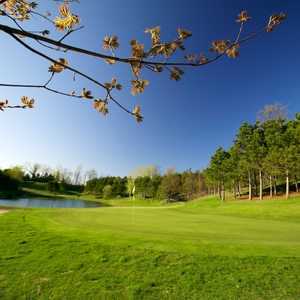 It's these greens that usher in high drama for the state's top pros at the Michigan Open each June. With this year's Open field doubled in size, The Bear's baby brother, The Wolverine Course will be included in the rotation for qualifying rounds. While The Wolverine has wider fairways, approachable greens and fewer places that severely punish errant shots, Galligan thinks it will play just a stroke easier than The Bear. "One major reason is it will be unfamiliar to many of the players in the field," he said. "There are also subtle slopes in the greens [on The Wolverine] that will make putts break more than on The Bear. On The Bear, the competitors know the golf course and they know when to go for it and when not to." For the average player, according to Galligan, The Bear plays about four strokes tougher than The Wolverine. On an off day, it can be even more menacing. The Bear doesn't have the feel of typical northern Michigan golf courses, with their elevated tees, wide fairways and inevitable steep downhill par 3s. Aside from the hotel tower that stands tall and can be seen from most points on the course, the layout could be dropped almost anywhere in Michigan. But that doesn't stop it from being a popular draw from golfers all over the state. "It's held up since the mid-'80s as a popular destination course for a lot of golfers," Galligan said. "It was really the beginning of the golf boom up north. It forced courses like Bay Harbor, Treetops and Shanty Creek, all of which were built after The Bear." Playing The Bear isn't cheap - fees for non-resort guests are $140 in the high season - but that gets you a course that is the best-conditioned in the area as well as the most prestigious. High-season rates on The Wolverine are the same; a less expensive alternative is Grand Traverse's third golf course, Spruce Run. Despite several recent ownership changes, Grand Traverse Resort has kept a good thing going; the three courses here still set the standard in the area. If you're the kind of golfer who makes a lot of bonehead mistakes, your score will balloon: The Bear specializes in turning bad shots into round-ruining ones. Gary Player's Wolverine is much more forgiving but not exactly easy, with a championship length and trickier greens. These are two of the most expensive courses in the region, yes, but also two of the best, from layout to conditions to service. 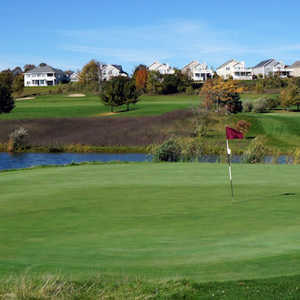 No trip to the area is complete without stopping by to play a Grand Traverse course - if you can pony up the cash. And if you do have the cash, stay in the Grand Traverse Resort tower. True, it does look quite out of place, lording over the trees as you wind around the Grand Traverse Bay, but the views are spectacular, and the accommodations are more like what you'd expect from a four-star Las Vegas hotel than something in northern Michigan. A more affordable alternative is the Holiday Inn Express just down US 31, which has nicer views of the bay and is closer to Traverse City. Amenities include free high-speed internet, pool and continental breakfast.